Castle Clout Clone Hits 500 Million Downloads. Posted November 2nd, 2011 by Karl & filed under Technology. As copying someone else and making all their profit goes, Rovio Mobile have done a marvelous job. Armor Games tried before them and failed with Crush the Castle, but where Armor Games failed, Rovio Mobile have taken all the plaudits. It seems almost implausible that such a simple game, that was in no way the first or original of it’s kind, should explode in such an extraordinary way into the public consciousness. But perhaps it is its simplicity that is the selling point. That is, its simplicity and accessibility. Now having been fully ported to almost all handheld systems, anyone can pick up and play Angry Birds anytime, anywhere. However, that to me doesn’t seem a good enough explaination for it’s success versus say, Crush the Castle, which can also be played and downloaded in the same manner. Perhaps then, it is the style at which Angry Birds carries itself that makes it so successful. Whereas Crush The Castle is perhaps a dull looking game carrying forth rather meek colours in gray and browns, Angry Birds is a colourful and vibrant game. It’s not just with the simple colouring that makes Angry Birds vibrant, it’s also what you might call the colouring of their characters, even if that colour might be an angry red. They’re certainly more interesting then the boorish gray blocks found on its predecessor. 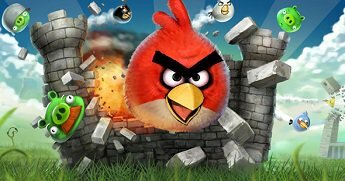 According to Rovio, Angry Birds gamers have so far been played a total of 200,000 years, with 300 million minutes of playing time daily. On top of that, 266 billion levels of Angry Birds have been played, 400 billion birds launched and more than 44 billion Stars have been collected. Quote courtesy of The Next Web. Despite the success of Angry Birds, these stats are still surprising to me. Especially being one that did himself play Crush The Castle (and enjoy playing it), it was hard to see how such a concept could take off (sorry) the way it has. They say “success breeds success”. That it certainly does. P.S. Rovio also released a video to its YouTube account stating the previously mentioned statistics and more. You can find this by going here.